Important news and announcements from the Forum. Please post any technical problems you are having with the forum or feedback. Please share any suggestions for changes or new ideas for improving the forum. Constructive criticism is welcome but please be kind. Our main board - the place to talk about all things calligraphy and lettering. Please share your calligraphy guild information here. All things related to flourishing, both flourishing calligraphy and off-hand flourishing. A place to share your work or talk about Eastern Calligraphy! All about handwriting: Learning cursive, tools, exemplars, etc. Tips, examples, help with design for calligraphy. The place to show us your beautiful work and tell us all about it. Post a word or phrase of the day for practice and sharing. A place to provide links to your favorite calligraphic books, resources, etc. Please be mindful of copyright and please do not post links to the same site over and over (i.e. IAMPETH). Share information about upcoming workshops and conferences. Ask a question, post a pattern, and/or share your wonderful zentangle creations! Any off topic chat (not related to calligraphy) can be posted here. in Re: Where in the World? Start here if you are new to our Exchanges and would like to learn how they work. The place to let your list members know when you’ve sent your exchange. A place to track the sending and receiving for this exchange. Let your list members know when your exchange has been sent. 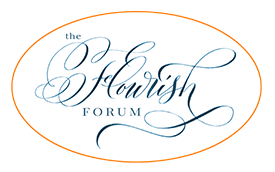 See all the amazing past exchanges by Flourish members! This board will eventually be closed as topics are moved into the Sharing and Caring Board. Please post general questions in the General Information board. Thanks! Great advice for left-handed calligraphers!